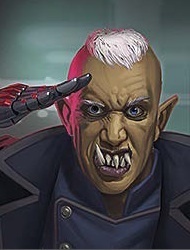 Self-serious Skraacha sergeant. Big on insignia and organization. Former member of the anti-Deus Resistance, he was one of the main liaisons between them and the Skraacha. His love for organization is partially a coping mechanism for his memories of the chaos of those years.